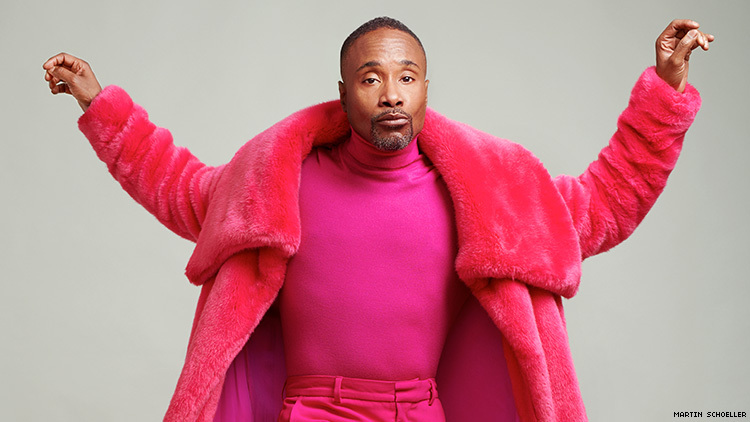 Few performances delighted and moved us in 2018 like Billy Porter’s turn on FX’s groundbreaking series Pose. Whether he was reading the children for their disastrous looks or losing his lover at the height of the AIDS crisis, Porter’s Pray Tell was one of the standouts on a show full of dynamic characters, and clearly we weren’t the only ones who noticed. On Thursday, Porter was nominated for Best Performance by an Actor In A Television Series – Drama, for the 2019 Golden Globes — something we saw coming, as we named Porter the Performance of the Year in the OUT100. Pose was also nominated Best Television Series, Drama, two huge wins for Hollywood’s burgeoning renaissance of queer stories. OUT caught up with Porter hours after the nominations were announced to talk about becoming a nominee , what Pose’s nominations mean for the future of queer representation in Hollywood, and what he’ll be serving on the red carpet. OUT: Set the scene for me, where were you when you learned you’d be nominated? Billy Porter: I’m in Atlanta on the set in my second shot of the day for a movie I’m in called Limited Partners with Tiffany Haddish and Rose Byrne. I was doing my scene with Jennifer Coolidge and I have the phone in my back pocket and it starts going off, which is what I was hoping for. I’m vibrating, I was shaking. Tiffany said, “You’re vibrating at the highest frequency of your creativity.” It’s unbelievable, it’s out of body, it’s surreal, it’s crazy. I’ve been in this business for 30 years, I’m speechless, and I’m a man of many words, so to make me speechless is a big deal. How does it feel to have been working in the industry for so long and be recognized with a Golden Globe nomination for a show like Pose, which has made such huge waves for queer people? As a person who lived through the AIDS crisis — I’m 49 years old — I’m so grateful to have lived long enough to see this day where the stories of LGBTQ people of color are being told on this level. It’s life changing, it’s world changing, it’s why we as artists do what we do. We have the power as artists to change the molecular structure of the world. That’s what this is doing, that’s what this show does, that’s what I feel in my heart. Pose was nominated for Best Drama Series, so how does it feel to have not just your work recognized but also the show? None of us do this alone. It takes a village and I’m very grateful and very happy that the work of everybody has been acknowledged through that nomination. It’s really astounding. What does this say for the future of queer representation in Hollywood? I can’t predict the future, but what I do know is that we are where we are and it’s a different space than we’ve ever been in and let’s make sure that we’re in the present, let’s make sure that we take this moment and we cultivate what comes next. I feel like this is a great time, to springboard this into a conversation that lasts forever. In Hollywood, it seems that queer stories don’t get told because they’re not seen as bankable, so now that a show like Pose is having such critical success, could we see more of our stories being told on television and in film? Yes, we have disproved [that], just like our marginalized communities continue to prove that theory wrong. It’s all about money, so the more people respond, the more work we’ll see. Is television ahead of film when it comes to queer representation? Yeah, a little bit. Television has a space to take more risks, especially now with all the outlets that we have. Niche markets have come back, because that’s how you break through. There’s so much in the market, it’s flooded with so much material that now those of us who have really specific niches get to break through. We’re seeing a lot more specific, niche storytelling break through in a really spectacular way, it’s really inspiring and encouraging. Do you know anything about season two of Pose? I know a lot about what season two is and you know I can’t say nothing! Where would you hope to see Pray Tell’s story go? I hope that we get to continue the representation of the community that we started last year. I call it the lost generation, those of us who lived through the plague and survived and came through the other side, and a pill came and everybody stopped talking about it, nobody’s talking about it, nobody’s remembering that we’re here and we need to heal. We can always love the pain away, you gotta feel it to heal it. This is a space artistically where we get to remind people of what we went through. We are warriors and I hope to be able to continue to represent that warriors. Before we go: girl, what are you gonna wear to the Golden Globes? I’m wearing a Randi Rahm couture piece that she is creating for me. So you’ll be serving on the red carpet, of course. I’m serving, I will always be serving the fashion, the looks, darling. I’m on Pose, it’s expected!